Develop a Histiocytosis UK website A national website providing information about the disease that can be found in children, young people and adults. Develop information materials for health professionals, patients, parents and the public A range of Histiocytic Disorders and Rare Diseases Guides. Your Questions & Support Information. Run a publicity campaign to raise awareness of Histiocytosis UK Plans were made for the official launch in September 2014 during Histio Awareness Month, and beyond this for a sustained campaign of awareness raising through dissemination of materials, media activity, publicity attendance at conferences and events, etc. Recruitment of clinical champions to support the knowledge transfer program. A network of Clinical Champions is currently in development with a number of Clinicians already based in the UK Medical Centres treating Histiocytosis. A micro-website has been integrated into HistioUK.org to help health professionals with diagnosis and treatment awareness of histiocytosis in children, young people and adults. The network of Clinical Champions in each of the medical centres around the UK are encouraging fellow health professionals regarding the project. Histiocytosis UK has joined the international campaign for the promotion of the disease by taking part in Histiocytosis Awareness Month each September. Histio UK is now on Facebook and Twitter. Communication with charity stakeholders - colleagues across the country who share our vision of quicker Histiocytosis diagnoses have come together to learn about the campaign and receive Histiocytosis UK materials and help spread the Histiocytosis UK message. We are growing a network of volunteers around the country who are distributing awareness information to their local schools, GP surgeries and hospital waiting rooms. With the increased publicity and spreading of the Histio UK message by word of mouth, the number of volunteer distributors is growing. These volunteers are enthusiastic and passionate due to their personal, family or friends experience with histiocytosis. Following the successful launch of Histio UK, it is critical that we build on the momentum of this vital project. Marshalling our growing number of volunteers into a more cohesive force and recruiting, over the next year, 100 Histio Champions around the country to complement the work of the Clinical Champions already in place. The Histio Champions will be responsible for spreading the Histio UK message around their local community. We will support the champions in distributing symptom cards and campaign information in the most appropriate places within their communities, such as GP surgeries; in giving talks to schools and nurseries etc. ; hosting stands at shopping centres; holding awareness-raising events such as tea-parties, and publicising what they are doing via the media, or through relevant networks, such as child-minders. Their aim will be to get the message to as many parents, young people and health professionals as possible. Paul established The Histiocytosis Research Trust with Dr Jon Pritchard in 1991. The two men met in 1982 when Paul took his 40-day old son, Nikolas, to Great Ormond Street Hospital. Nikolas was diagnosed with multi-system LCH and given only a 30% chance of survival. After embarking on a number of treatments, Nikolas survived against the odds and despite having some 'late effects' of the disease, remains, together with his family, determined to raise awareness of histiocytosis and encourage scientists and clinicians to keep researching the disease. The family hope there will one day be a cure. Peter trained as a physician but carries out research in immunology. His research focuses on understanding immunological memory and how the properties of memory cells contribute to protective immunity and disease pathogenesis. He trained at the National Institute for Medical Research in London and after postdoctoral work at Sloan Kettering Institute in New York, joined the Imperial Cancer Research Fund Tumour Immunology Unit in 1973, becoming Director in 1992. From 1995-2005 he was the Scientific Head of the Edward Jenner Institute for Vaccine Research at Compton in Berkshire and subsequently worked on immunity to tuberculosis at Oxford University until 2014. He is currently a Visiting Professor at Imperial College London. He has published over 200 papers in refereed journals and served on committees of the Medical Research Council, the Wellcome Trust, several other UK medical charities and international bodies. He has been involved with the Nikolas Symposia on the Histiocytoses as organiser and advisor since 1989 and has been a Trustee of the Histocytosis Research Trust, now Histiocytosis UK, since its inception. He was elected a Fellow of the Society of Biology in 2003 and the Academy of Medical Science in 2003. As Trustee I have been particularly interested in ensuring that funds raised in the UK and elsewhere for research into Histiocytoses have been spent as effectively as possible. To this end I recruited and chaired an International Scientific Review Board of distinguished scientists, including the Nobel prizewinner, Prof Ralph Steinman, to review applications to the Trust for funding. Although I have stepped down from chairing the Review Board, I remain concerned to ensure that funds raised should be spent as effectively as possible both to further research into Histiocytoses and to promote the well being of patients and families. In the case of Langerhans Cell Histiocytosis the discovery of the BRAF V600E mutation suggests that the focus of efforts for this disease should now be to exploit this discovery for the benefit of patients either as a diagnostic and prognostic tool or as a target for novel therapies. For Haemophagocytic Lymphohistiocytosis, gene therapy is likely to become possible eventually and should if possible be supported. Graduated from Oxford University Medical School in 1995, having obtained a DPhil in Immunology in 1992. Completed specialist training in Haematology and Transplantation in Newcastle in 2004 and was appointed as a Consultant Haematologist in 2006. He has followed a combined clinical and research career initially funded by Leukaemia and Lymphoma Research through a Clinician Scientist award (2002) and Bennett Senior Fellowship in Experimental Haematology (2006). Since 2006 he has been a Clinical Senior Lecturer at Newcastle University. He became Professor of Haematology and Director of Adult Bone Marrow Transplantation in 2010. Matt said “At the Northern Centre for Bone Marrow Transplantation we work to deliver a state of the art service, providing about 150 transplants each year to patients from across the region. My research focuses on dendritic cells, a type of white blood cell critical for the initiation of immune responses including those that occur during transplantation. I also look after and study patients with dendritic cell diseases such as Langerhans Cell Histiocytosis and dendritic cell deficiency”. As a baby, Peter's daughter, Lea was diagnosed with multi-system LCH and also developed haemophagocytic syndrome. After a year of chemotherapy, there was little hope but doctors at the Nikolas Symposium in Greece developed a salvage therapy which was successful. Within weeks, Lea had left hospital. Now a healthy 13-year-old, Peter believes Lea's story shows the value of working together to find treatments and ultimately a cure for all histiocytosis patients. Consultant Paediatrician Dr Nanduri is an expert in both paediatric LCH and HLH as well as other histiocytic disorders. She is based at Watford General Hospital. Dr Visser is a Consultant Paediatric Oncologist in the East Midlands Children’s and Young Person’s Integrated Cancer Service. He is based at Addenbrooks Hospital Cambridgeshire and has a special interest in histiocytosis, sarcoma and clinical trials. He is an active member of the Histiocyte Society and the Children’s Cancer and Leukaemia Group. Claire is a Senior Clinical Lecturer at UCL Great Ormond Street Institute of Child Health and Honorary Consultant in Paediatric Immunology and Gene Therapy at Great Ormond Street Hospital, London. She now works as a clinical academic involved in an expanding number of gene therapy clinical trials at Great Ormond Street Hospital which treats patients with immune deficiencies, haematological and metabolic disorders. 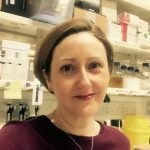 Her pre-clinical research focuses on the development of gene therapy strategies to treat HLH disorders; XLP-1 and XIAP deficiency using a conventional lentiviral mediated corrective strategy alongside exploration of novel gene editing techniques to facilitate targeted gene addition in both haematopoietic stem cells and T cells. As an attending physician she oversees the clinical management of patients with PID, including hematopoietic stem cell transplantation and maintains a strong interest in HLH disorders. LCH/neoplastic board:Barrett Rollins MD, PhD., Carl Allen MD, PhD., Florent Ginhoux MD, PhD., Ely Diamond MD. HLH board: Michael Jordan MD., Yenan Bryceson PhD., Mike Dustin PhD. ,Rob Wynn MA MD MRCP FRCPath. Dedicated to promoting scientific research to uncover the causes of histiocytic diseases and ensure early diagnosis, effective treatment and a cure. In 1981, Dr. Pritchard met the Kontoyannis family after their son Nikolas was diagnosed with multi-system LCH. He suggested to Nikolas's father Paul that the best way to seek a cure for LCH would be to organise a meeting where scientists and clinicians could get together to discuss the disease. The first Nikolas Symposium was held in 1989 in Cambridge and has been organised annually ever since. Following on from this first meeting, Dr. Pritchard suggested that a charity should be set up to raise money to fund research into the disease and The Histiocytosis Research Trust was born in 1991. Dr. Pritchard is remembered as being an outstanding individual who contributed and worked tirelessly for the causes he strongly believed in. He was very energetic, endearing, intelligent, cheerful and reassuring. He led the way and supported both The Trust and The Nikolas Symposium in their efforts to search for a cure for LCH. He provided unrelenting support to all his patients and their families and will never be forgotten by the many he helped. He is remembered for bringing a smile to every ill child as well providing strength and hope. In 2014 the Histiocytosis Research Trust merged it activities with Histiocytosis UK. Our aims to provide information support to patients and their families and raise public and professional awareness of histiocytic disorders. If you are interested in becoming a Histio UK Champion or Histio UK Volunteer, please contact us on Histio@HistioUK.org. Histiocytosis UK has an independent Scientific Review Board to help it decide how to fund research projects, our Scientific Review Board utilises a peer review system to review applications and recommend the best application to the Histio UK Trustee Board for funding. In 2014 the Histio UK Board of Trustees appointed Professor Matthew Collin BM, BCh, DPhil, MRCP, FRCPath as Chairperson of the SRB, with Professor Peter Beverley MBBS, DSc, FmedSci., rotating to the position of Vice-Chairperson of the SRB.